In addition to top-rated learning sessions, Canada Logistics Conference 2018 features plenty of opportunities to network with your fellow delegates. Canada Logistics Conference is attended by a mix of shippers (from a variety of industries including manufacturing, retail, food & grocery, agriculture, oil & gas, and more), carriers (including road, rail, pipeline, marine & air), as well as 3PLs, ports and providers of ancillary services. Most are at the manager level or more senior, including directors, VPs, presidents and the C-Suite. Delegates travel from all across the country to attend this annual event, and the group is consistently described by new attendees as a warm, welcoming and collaborative community. The daytime program includes both networking breakfasts and lunches, so instead of scattering to find food or catch up on emails, delegates can come together to debrief on the learning session topics and discuss business in general. There are also morning and afternoon networking coffee breaks on Thursday and a morning coffee break on Friday, giving delegates the opportunity to network with each other and Canada Logistics Conference exhibitors in between learning sessions. 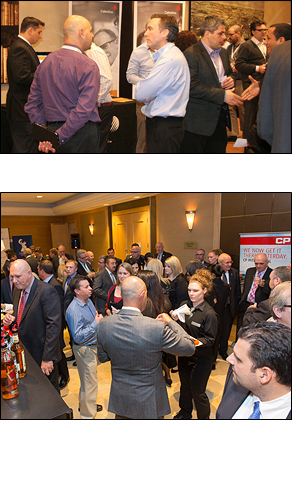 Finally, Canada Logistics Conference 2018 also features social & networking events each evening. All full conference passes include the option to attend an opening networking & cocktail reception at the beginning of the conference, and a awards evening at the end. Single & guest tickets to these events also available. Kick off your conference experience by meeting and networking with about 200 of your fellow supply chain logistics professionals. The conference opening reception will be held at Vancouver Lookout, and will bring together conference delegates from across the country as well as the Vancouver area supply chain logistics industry. Immediately preceding the Awards Dinner, the annual Cocktail Reception gives delegates a final opportunity to mingle and network freely. The Cocktail Reception kicks off the evening, a hugely popular social and networking event that traditionally has the highest attendence of any part of the Canada Logistics Conference program. "It was great to connect with other professionals attending the conference. Working for a 3PL, we are always looking for new customers, as well as carriers to cater to our—and our customers' and shippers'—needs." "As someone new to logistics, I appreciated the openness and professionalism of your delegates. They all, with rare exception, passed me a business card and extended the offer of ongoing support after the conference where there is little or nothing for them to gain personally from it. A very welcoming group of individuals." "I got a lot of good, practical information from my fellow delegates on specific issues I'm dealing with. That information gave me solid negotating leverage resulting in better service." "The interactive sessions were an excellent opportunity to interact with other delegates. The caliber and quality of Canada Logistics Conference delegates is excellent, and speaks to the importance of the conference itself." "Throughout the year, I often look to the people I met at Canada Logistics Conference, and trust them more than those I've met through other events. I really like that the people that attend aren't all representatives of the sales arms of their companies."